Each Business has an Application for Licence (Renewal) Form to complete. The first page should be checked, and any incorrect information amended. The reverse side of the form comprises the declaration. This should be completed by the Property Agent named to manage the authorised place of business. If there are multiple authorised places of business, the person at the first address listed. There is a requirement for all directors of the company to be named on the Board’s Registers. ​With the renewal documentation a current copy of a recent ASIC document that lists all the Company Directors should also be forwarded. All applications and fees must be lodged with the Property Agents Board by 30 April 2019. Late fees apply for the late lodgement of licence applications (that is, received after 30 April 2019). Applications can be lodged by mail to Property Agents Board, Level 1, 15 Victoria Street, Hobart 7000 or preferably via email to board@propertyagentsboard.com.au. 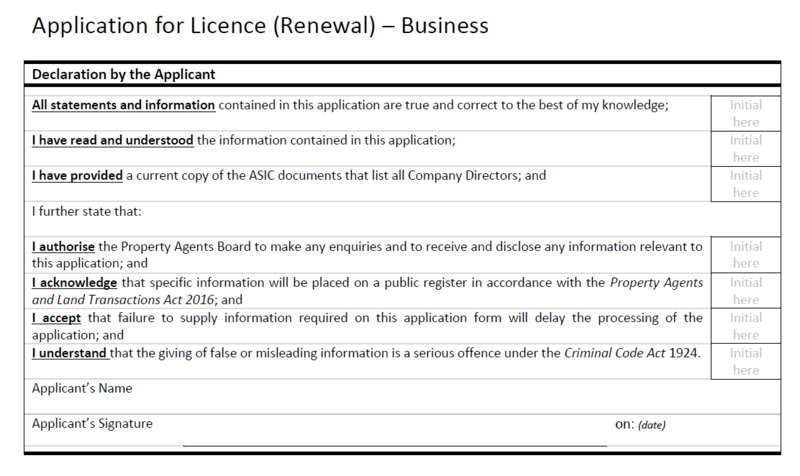 To assist the Board, if emailing please scan each Application for Licence (Renewal) form separately. Applications cannot be regarded as having been lodged unless they are correctly completed (with all required accompanying documents), signed and the correct fees paid. Any incorrect information on the licence should be amended. A current copy of the ASIC document that lists all Company Directors should be included. ​All applications and fees must be lodged with the Property Agents Board by 30 April 2019. Late fees apply for the late lodgement of licence applications (that is, received after 30 April 2019).